It was really inspiring to go to the opening of the new John Hoyland Wing at Anchovy Primary School on February 23, 2017. Beverley Heath Hoyland was there to officially open the two new classrooms which she has funded through a £56,000 grant from the John Hoyland Trust. 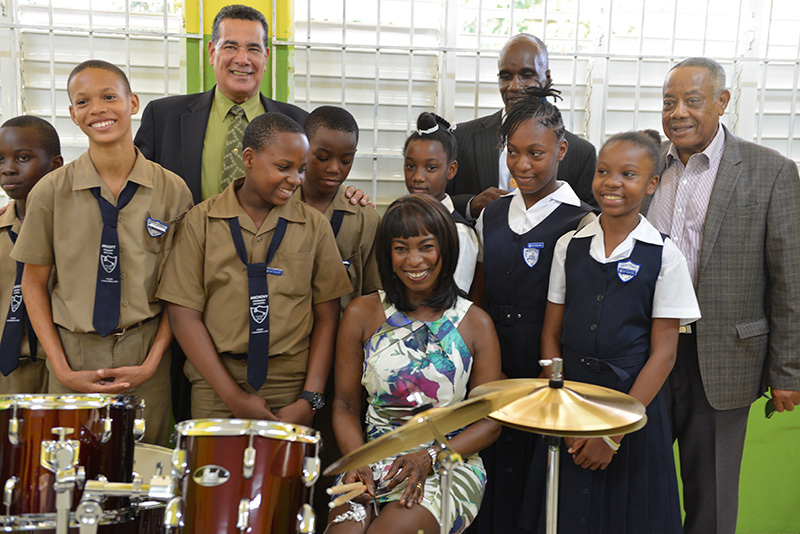 Beverley, who now lives in the UK, was born in Jamaica and attended this school when she was a little girl. She was married to the famous painter John Hoyland and explained how her husband, who sadly passed in 2011, fell in love with Jamaica and regarded it as a second home. 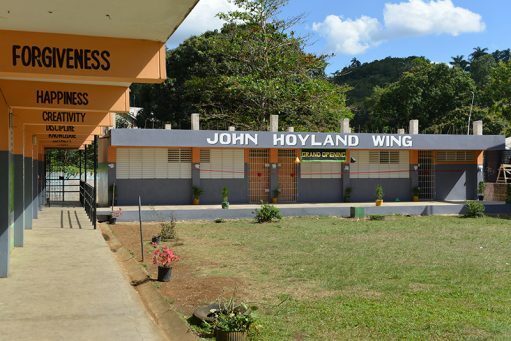 The classrooms will also function as emergency shelters in times of need and have been built to ensure they withstand natural disasters such as earthquakes and hurricanes. Derek and I met Beverley last year at the opening of the Raphael Albert Miss Black and Beautiful exhibition at the Autograph Gallery in Shoreditch. She is a former beauty queen and Albert, who organized many beauty pageants in London, had photographed her in the 1980s. Derek, who was working with Autograph at the time, helped contact her and several other former beauty queens who were invited to an end-of-exhibition party. 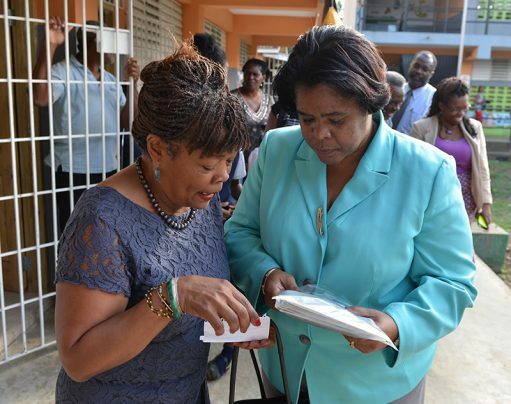 That was when I found out about her wonderful project at Anchovy and as we planned to be in Jamaica at the time of the handover, Beverley invited us to attend. It was such a wonderful gesture and a brilliant example to others. The opening was attended by Mr Homer Davis, the Mayor of Montego Bay; The Hon Derrick Kellier, Member of Parliament; and Dr. Michelle Pinnock, Director, Ministry of Education Region IV. I was able to make contact with Dr Michelle Pinnock, Ministry of Education Director for the region, who made an inspiring speech praising Beverley for her vision and generosity. We discussed my work in bringing books to school and she promised to help with some of the paperwork next time. 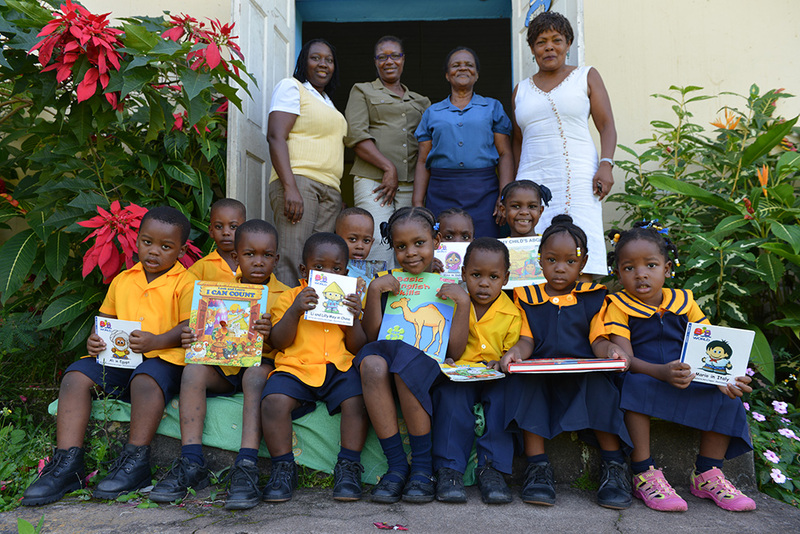 This photo is of children and teachers at the St James Day Care and Learning Centre in Mount James, St Andrews, where I made a delivery of books which I wrote about in a previous blog. We weren’t able to take photographs then, as we arrived at the school late in the day when the children had gone home. So we decided to leave the photographs until our next visit. It was great to go back and see the books being used by the children and being displayed around the classrooms. We met two teachers, Ms. Monica Lewis and Ms Myrna Fairclough, together with Ms Inez Ball the school’s cook. Teachers told us how grateful they were for the books and how they have helped, particularly in subjects such as Maths, Reading, and transport where teaching these subjects were greatly improved with our gift to the school. A big thank you to all those who took the time and trouble to collect books and bring them to my house in Birmingham.